Crisis situations are shaking two Canadian communities to their very core -- the terrifying wildfires that destroyed Fort McMurray and the epidemic of attempted youth suicides on the Attawapiskat First Nations reserve. The question arises: Why are billions of dollars being pumped in to deal with one crisis while the other is all but being ignored? By the time Fort McMurray is rebuilt, it's likely that governments will have spent $2 billion or more. Donations from Canadians will reach into the millions. And a representative of one of the big insurance companies estimated they will be required to pay as much as $9 billion to restore homes and businesses. In comparison, the federal and Ontario governments are spending a pittance to alleviate the suicide crisis in Attawapiskat. I have no quarrel with anything that is being done to help the people and community of Fort McMurray. The destruction and emotional distress suffered by residents is taking a heavy toll. Like thousands of other folks, I have made a financial contribution. What I do object to is that, in comparison, the federal and Ontario governments are doing practically nothing and spending a pittance to alleviate the suicide crisis in Attawapiskat, a poverty-stricken, isolated community of 2,000 located 720 kilometres north of Sudbury. The youth crisis reached epidemic proportions just days before the fire outbreak in Fort McMurray. 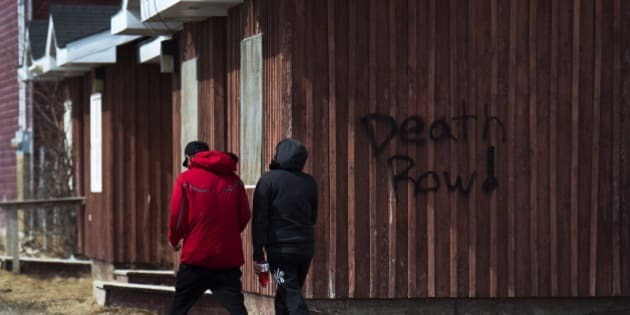 Eleven Attawapiskat young people attempted suicide during the same night. Local hospital staff, unable to deal with the situation, became frantic. Following an urgent appeal for help, the federal and Ontario government sent a handful of medical specialists to comfort the young people. The support didn't help much. Last week, on the second day of the fires in Fort McMurray, Attawapiskat experienced nine suicide and overdose attempts. Chief Bruce Shisheesh of Attawapiskat urgently contacted Prime Minister Justin Trudeau and asked for a second meeting. He told Trudeau it was now "a matter of life and death" in his community. "While the efforts of your ministers is appreciated to date, it falls short [of] finding Attawapiskat has been under a state of emergency since early April, with chief and council saying it has been overwhelmed by ongoing suicide attempts," he said. The Prime Minister's Office replied that Prime Minister Trudeau could meet with native leaders in Ottawa when it was convenient to both parties. Earlier, Trudeau charmed native leaders and reserve folks with vague promises and double-talk: "I don't want to pretend that any of us have the answers to the challenges facing Indigenous peoples in Canada, but what I will tell you that as a country, we can build those answers." Clearly, compared to the human touch extended to the victims of Fort McMurray, governments are being callous in their responses to the Attawapiskat crisis. In April, federal Minister of Indigenous Affairs Carolyn Bennett made a trip to Attawapiskat and promised funding for a new youth centre and some programming for young people. In addition, a youth delegation from the region will be invited to visit Ottawa. The Ontario government has pledged $2 million over the next two years for health support and a youth centre for the community. Where is the empathy in those kinds of promises? A lack of money is not the problem. The federal government is sitting on about $4 billion to be used to improve lives, particularly education facilities, on reserves. What is hard to understand is why the federal government isn't dipping into its stashed-away billions to assist First Nations communities such as Attawapiskat. If respect for human life is a factor, surely the greatest threat is at Attawapiskat. In Fort McMurray, luckily, only two people lost their lives, and that was due to a vehicle accident. In Attawapiskat a 13-year-old girl committed suicide last October. Since last fall, others have died and there have been more than 100 suicide attempts in the community. Children -- kids who should be growing up bright and enthusiastic -- are trying to kill themselves. Instead of loaning psychiatrists and medical support to the sad little hospital on the reserve, staff levels should be doubled or tripled until well after the suicide crisis is over. Much of the housing on the reserve is uninhabitable and contributes to suicidal feelings and other problems. The same military planes that were used to help Fort McMurray should be deployed to air-lift new pre-fabricated houses and community buildings to Attawapiskat. If a non-aboriginal community were threatened by dozens of children trying to commit suicide, government and public response would be overwhelming. I contend that the decades of poverty, the murder of more than 1,000 women, the many youth suicides, and the general degradation of a race of people deserve equal attention to the aid and love being bestowed on Fort McMurray. So, why is one crisis receiving massive support, while another, perhaps more serious in some ways, is getting little attention? Governments and the public reacted so positively and so quickly to the Fort McMurray situation because the fire was so immediate and horrific. Now millions will be spent to allow the energy companies to get back to scraping up oil sands. While I don't have a lot of faith in Liberal governments, I am surprised that, given the strong stand Trudeau has taken concerning aboriginal issues, he hasn't taken more action more quickly. On the other hand, the problems on reserves such as Attawapiskat have been with us for generations. While there have been improvements in the attitudes of many Canadians toward indigenous people, many others still don't think they should be helped. If there were overwhelming pressure on the government to help Attawapiskat, it would be happening. Of course if a non-aboriginal community were threatened by dozens of children trying to commit suicide, government and public response would be overwhelming.